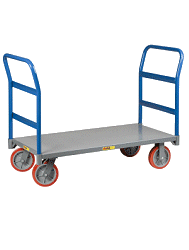 DESIGNED FOR THE DUAL PURPOSE OF MOVING CONVENTIONAL BOXED ITEMS AS WELL AS 55 GALLON DRUMS. THE UNIQUE DESIGN OF THE CHIME HOOK ALLOWS THE USER TO ROTATE THE HOOK OUT OF THE WAY FOR HAND TRUCK APPLICATIONS THEN ROTATE IT BACK TO CARRY 55 AND 30 GALLON DRUMS. 14 GAUGE TUBING WITH 1/4'' BASE PLATE. CONTINUOUS HANDLE DESIGN GIVES THE USER ONE OR TWO HAND OPERATION OF THE UNIT.